The Vial of L.I.F.E (Lifesaving Information for Emergencies) is a free program that helps Senior Citizens, and others with special medical needs, have their complete medical information ready in their home during an emergency. It provides critical information about medical history and current medications when a patient is not able to speak or remember this information. Emergency medical personnel called to a home can lose precious minutes trying to gather information about the person’s medications, allergies and illnesses. “Vial of Life” kits can help. • Instructions on how to use the vial and fill out the form. • A five-inch plastic vial to store the completed medical form. The vial should be placed on the top shelf inside the refrigerator door. 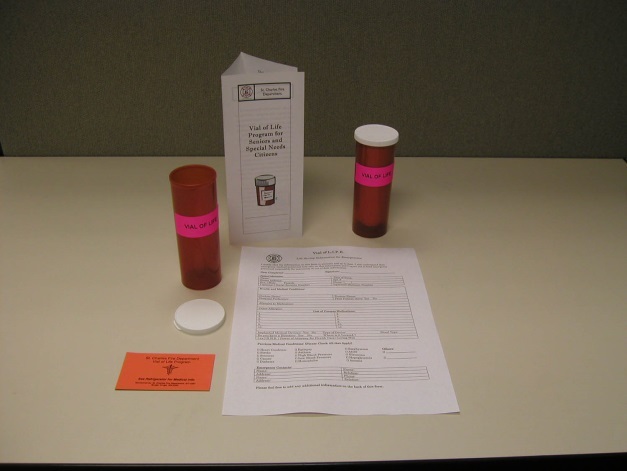 The vial is large enough to hold a copy of the durable power of attorney for health care and/or pre-hospital do-not-resuscitate form. • A Vial of Life magnet also is placed on the outside of the refrigerator. St. Charles Emergency Medical personnel know to look for the special Vial of Life magnet when they respond to a call. 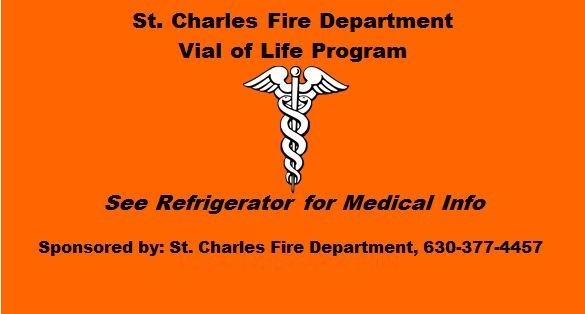 Please call the St. Charles Fire Department at 630-377-4457 to obtain your free Vial of Life. What is Vial of Life?